One of the most creative aspects of writing “things to do” poems for me is imagining what it might be like to be something other than myself. As I was writing poems for my book THINGS TO DO, I wondered what I would do if I were certain animals, elements of nature, and inanimate objects–including the sun, sky, rain, birds, a snail, an acorn, an eraser…even a pair of boots splashing in puddles. I focused on the actions of the subjects of my poems…and tried to select the most dynamic/strongest verbs to describe those actions. • Acorn: …snap from your stem…/Fall to the forest floor below./Tempt a scavenging squirrel. • Sun: Shower down warm yellow rays./Rule the sky on summer days. • Crickets: Rub wings/and sing/a lullaby. • Moon: Wax and wane/in you starry terrain…/Hang in the darkness./Dazzle the night. One of the poems that I cut from the manuscript for my book THINGS TO DO is about a stapler. It’s an object that I used every day when I was teaching in an elementary school. In the poem, I imagined that the stapler had jaws and teeth and could bite! Click your metal jaws together. with your teeth of steel. Share my stapler poem and the other poems from my book with students. Tell them to listen for verbs that describe the actions of the subjects of the poems. After reading each poem, ask students to name the verbs I used. Make a list of their responses on chart paper. I taught elementary school for over thirty years. My students wrote lots of poems. I often coordinated their poetry writing with the science units that we were studying in class. My students especially enjoyed writing “things to do” list poems about animals. Before asking my students to write their own “things to do” poems, I gathered them together and had them collaborate on writing a class poem. First, we would decide on an animal to write our poem about. Then I’d talk to them about trying to select verbs that best described the actions of that animal. I told them we’d try to begin each line or sentence of our class poem with a verb. On a large sheet of chart paper, I’d write down the rough draft of our poem. Next, we’d read through it–sometimes adding to the poem or making changes as we did. Then I’d give my students a day to reread the poem to themselves…and to think about any changes they’d like to make to the class poem. The following day, as we worked on revising our class poem on another sheet of chart paper, we’d try to think of more dynamic verbs that could be used in place of the ones in our first draft. After we finished, we read aloud the final draft of our class poem. Then I sent students to their desks to write their own individual “things to do” poems. Having my students write “things to do” poems was not only an enjoyable creative writing activity for them–it was also an excellent language arts exercise. Being thoughtful about their verb selection helped to make their writing stronger. Zoom around a haunted house. and skin as green as grass. and turn them into toads. and frog eyes for lunch. and catch them in your mouth. Elaine Magliaro worked as an elementary school teacher for more than three decades and as a school librarian for three years. She also taught a children’s literature course at Boston University from 2002-2008. 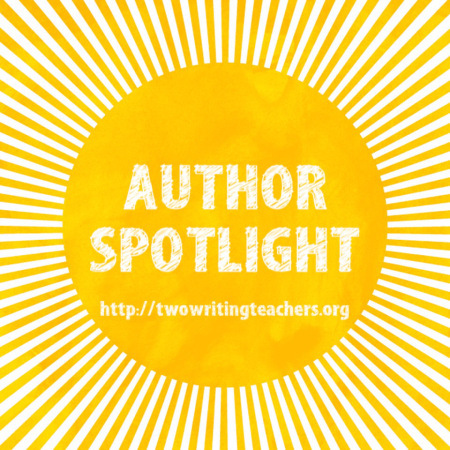 She served on the advisory board of the Keene State College Children’s Literature Festival from 2006-2008 and as a member of the NCTE Poetry Committee from 2009-2012. Elaine is now retired and writes poetry for children. THINGS TO DO is her first children’s book. This giveaway is for a copy of Things to Do. Many thanks to Chronicle Books for donating a copy for one reader. 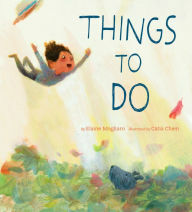 For a chance to win this copy of Things to Do, please leave a comment about this post by Wednesday, May 31st at 11:59 p.m. EDT. I’ll use a random number generator to pick the winner, whose name I will announce at the bottom of this post, by Friday, June 1st. If you are the winner of the book, I will email you with the subject line of TWO WRITING TEACHERS – THINGS TO DO. Please respond to my e-mail with your mailing address within five days of receipt. Unfortunately, a new winner will be chosen if a response isn’t received within five days of the giveaway announcement. Comments are now closed. Lehua Gerboc-Naulangi’s commenter number was selected so she’ll win the copy of Things to Do. Beautiful book! Looking forward to adding it to my collection! Building my poetry collection and this was wonderful to read. I would love, love, love to use this children’s book with students to highlight and strengthen working with vivid verbs! I love this post! This is definitely a “Things to Do” when I teach poetry. Love these poems, it would be fun to see what they can come up with. Thank you for sharing. These are so much fun. Our students just finished a poetry unit and they would love this! What an awesome idea for a book! I’ve got to check this one out since I love poetry books that are unique, and I love making lists. This is a winning combination! Love this book! I can’t wait to share these great ideas on how to use this book with teachers and students! My favorite is “Things to do if you are a PENCIL” and I know my students will love it! Can’t wait to try this in my classroom. Thanks for sharing. We read and wrote “things to do” poems yesterday, and the students came up with some amazing creations. We started our lesson by reading “I am the Dog, I am the Cat” to review perspective. One of the students wrote from the perspective of hair. It was hilarious. Thank you for the idea! Excited to use this idea in my classroom today as part of our multi genre project we are working on. Thank you! I am co teaching with a fourth grade class right now working on a poetry unit. I can’t wait to try “Things to Do When You’re A…” poems with them! Can’t wait to try some writing like this with my students! So much fun! I am inspired. 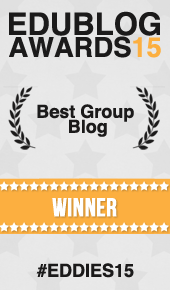 Amazing post, amazing book, amazing classroom ideas! Thank you so much! I am planning on using this as part of my summer religious education program. Looks like fun! Thank you and best wishes to Elaine who publishes! This sounds like a great bridge between poetry and fiction, too. The focus on action in the poems would lead so well into the focus on bringing characters to life with action and dialogue, especially. My first graders are working on poetry from now until the end of the year. I just ordered your book on Amazon. I can’t wait to use it as a mentor text. Thanks! I just added a link to this post to my plans for next year. Can’t wait to see what my students create. Oh phooey. Wish I had done this with the kids before the school year was over. There’s always next year! 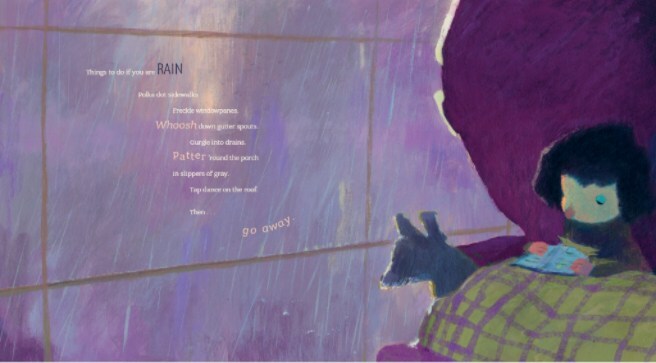 This looks like a fabulous book to share with our young poets! I love this idea! Thinking about trying it out these last days of school. “Things To Do” poems are my favorite right now! I love your book and am looking forward to using it and your ideas next week in my classroom. Thanks for sharing! Love these poems. We only have 2 days of school left this year, and I’m already looking forward to next year just so I can try this out with my new students. What I love most about these poems (and the exercises in the book) is that it uses such fresh language! I feel like I use the same action words to describe things and it makes my writing (and therefore my students, when I am modeling a writing piece) sound mundane. These are great! Thanks for sharing! This book sound absolutely wonderful. It is the last week of school, what a better way to end the year than with these ideas. Awesome. Thanks for sharing. What a fun way to discuss strong verbs! This has made me look at objects differently today! This book of poems sounds terrific! I can’t wait to share this idea with my students. We’ll finish out the year next week using this! I’m looking forward to trying this poetry exercise. I love how it helps children use personification in their poetry. A great book, and lesson, that demonstrates the power of verbs. I am now a Teacher-Librarian and this book would be an excellent addition to my library, and a great resource for my teachers. So excited about sharing this lesson with my classes! Thanks! Love the ideas in this post. Can’t wait to try them out with kids! Love this concept of thinking about action words in such a creative way, while fostering a poetic sensibility of seeing ordinary objects in new and interesting ways. I will definitely share this idea with my teachers. Can’t wait to try Things to Do Poems with my Wonder Writers next Friday morning. They are loving exploring poetry. I love the poems and the ideas for activities to do with the students. Oh, love your poems. I think the kids would have a blast trying their hand with this. Thanks for sharing! I love the pencil poem! I’ll share it with my kids today! Thank you. I love this! Would definitely love a copy and what a fun writing activity to do with kiddos! This book can be a helpful starting point for writing at any age. The creativity that poetry invites is so visible here. What a fine resource for teachers and children. Thank you for the ideas! We are currently in our poetry unit and will give this a try with my fourth graders. Thank you for this wonderful post describing the how to’s for writing Things To Do Poems. You have encouraged me to try one. And I know my students would LOVE writing these poems. So creative! Fantastic! My son is in a poetry unit now – can’t wait to share this idea with him. I’ve had this book recommended to me but haven’t gotten it yet. I love Things to Do poems and had my students try it out over poetry month. Thanks for this post! Things to do poems sounds like a fun activity that will keep my 6th graders engaged these last few weeks of school. What a great concept and we’re always working on word choice. I can’t wait to try them and of course, would love a copy of Elaine’s first book. Thanks for the inspiring ideas. This book looks amazing! I love these poems! Trying them with my middle school writers!!! Thanks for the inspiration! I’d love to have this book! I already bought this book and we love it! I’d love to have another copy to gift! Thanks for the great lesson! I often worry that poetry is too hard for kids. But writing a few together seems to help my students get going! Looks like a great book!